Why this matters: The study, by researchers at the University of Wisconsin and University of Oregon, concludes that sea level rise is not a far-off problem for the end of the century, but rather a "devastating" risk facing the U.S. telecommunications industry in as little as the next 15 years. About 4,000 miles of fiber conduit (both long and short-haul) will be underwater and about 1,000 nodes, or connection points, "will be surrounded by water" in the next 15 years. The sea will gradually flood colocation facilities, which are buildings that contain physical servers that belong to different companies. Ocean waters will also turn metro fiber optic cables into undersea cables, which they weren't designed for. Methodology: The study based its projections on a prediction of anywhere from 1 to 6 feet of sea level rise, with water levels rising with each passing decade out to 2100. 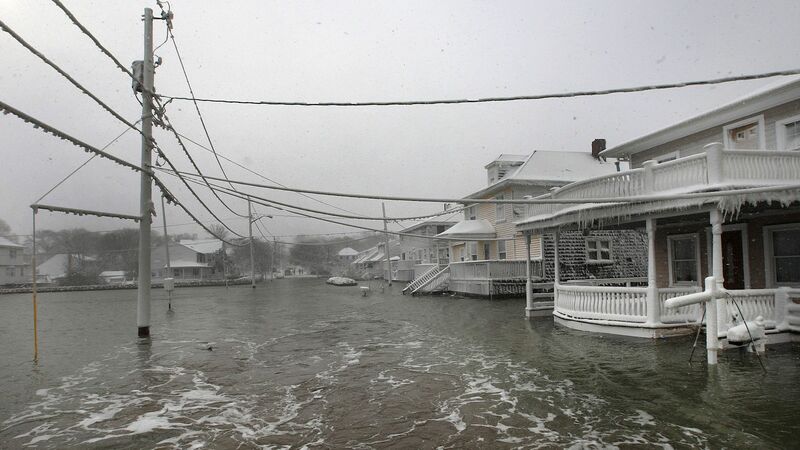 "The threat of climate change-related sea level rise to Internet infrastructure is imminent." — Ramakrishnan Durairajan, lead author of the study and a computer science professor at the University of Oregon, in an email. Threat level: The study found that New York, Miami and Seattle have the most infrastructure at risk. It also found that CenturyLink, Inteliquent and AT&T are at highest risk from sea level rise, due to where their infrastructure is located. "The main surprise was that the majority of effects of sea water inundation on internet infrastructure will be felt in the next 15 years," said study co-author Paul Barford, a computer science professor at the University of Wisconsin, via email. "The reason is that much of the infrastructure in coastal areas is actually quite close to the current shoreline." How they did it: The researchers combined two databases into one: Maps that show internet infrastructure, taken from the Internet Atlas, as well as NOAA "sea level incursion" maps based on sea level rise scenarios. They used this combination to create a new metric called coastal infrastructure risk, which combines the geographical scope of affected infrastructure with internet infrastructure density. Using this, they were able to rank cities and companies that are most at risk. Yes, but: The new study has not yet been published by a scientific journal. It was, however, peer reviewed in order for the findings to be presented at the Applied Networking Research Workshop on Monday in Montreal and published in the proceedings of the forum. The study applies mainly to internet infrastructure on America's coasts, though outages could spread inland. It does not indicate what climate change could do to the physical internet in, say, inland cities such as Omaha or Dallas, where sea level rise is not a threat. Reality check: The new research also doesn't include knock-on effects from losing inland facilities as well, such as during high wind events that also flood the coastline. "While the risks due hurricanes and thunderstorms are known," Durairajan said, "very little attention is paid to climate change-induced sea level rise. The impacts will only magnify if we consider sea level rise PLUS its effects (e.g., hurricanes) in tandem," he added, referring to how climate change is altering extreme weather events. Also, the study may not have captured all the internet components that are at risk, says Greta Byrum, the co-director of the Digital Equity Lab at The New School in New York, who was not involved in the new study. Such data is voluntarily disclosed by companies and is "notoriously hard to get," Byrum said. Cities like New York, which suffered telecommunications outages from Sandy, are trying to add more resilience into its networks. "The City is engaged in an ongoing dialogue with telecom providers regarding the resiliency of their networks and facilities in light of the risks of climate change such as hurricanes and sea level rise," said Priya Shrinivasan, Director of Policy, Standards and Legal Affairs in the mayor’s Office of the Chief Technology Officer, in a statement. The bottom line: The new study shows yet another way that climate change may affect our daily lives in the near-term. It also provides a warning to city leaders and telecommunications companies that they need to prepare for disruptions. "This means expanding our assessments, mitigation planning and risk-aware deployments should begin today," Durairajan said. Editor's note: This story has been updated to include comments from a study co-author and an outside researcher.